Did you know the Jewish holiday of Passover began last night, April 14th, at sunset and continues until the night of April 22nd? This important holiday commemorates the liberation of the Jewish people in Ancient Egypt. If you have a minute, check out the post on the Little Passports Blog where a Little Passports employee details one of her favorite childhood memories of the Seder during the first night of Passover. Do you have any fun family traditions you’d like to share with us? 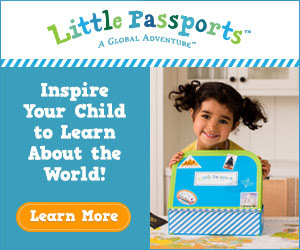 Little Passports is also hosting their own Facebook giveaway this week! Use this link below to sign up to win a 1 year Little Passports subscription and a 1 year NatureBox subscription. (That is almost $400 worth of goodies!) The deadline to sign up to win this prize is April 18th. If you miss out on this weeks opportunity, don’t fret…There are 2 more weeks of giveaways to enter. Your Affiliate Banners: Grab one for your post!